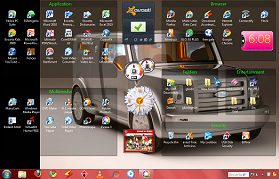 As you all know that there are many pc software to take a screenshot on pc but today am dropping the easiest method without worrying to download any software again. Taking screenshot is an amazing things because I can remember those awkward moment when I want to share an amazing things on screen to my Social Network friends, instead of taking the screenshot, I will now look around for a good camera either a sharp mobile phone camera or a digital camera and will snap and later edit to my taste which takes as long as 30mins before am through with all, consider with just a click method I want to share with you now …it sounds funny? Lol. To do this, you will need only any Image Editing Software like Picasa , Photoshop , PhotoScape and the likes AND you can as well use the default Image editor that comes with system PAINT . When you now want to take a screen shot of a screen or web page, just hit your Prt SC button at the top by the right on your keyboard..
Lastly…Guess what? Just click on the SAVE button or press CTRL S on your keyboard AND YOU ARE GOOD TO GO !! !